Information of interest to people travelling from Barcelona to Calella. 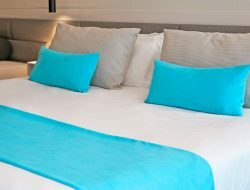 Barcelona, El Prat airport and Calella, as well as other touristic towns on the Barcelona coast, have an important network of suburban railroads that allow you to travel around the area quickly, comfortably and cheaply. 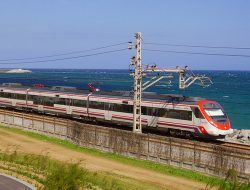 The aim of this blog entry is to help you with some useful indications for everyone deciding to travel by train from Barcelona to Calella and the other way round. 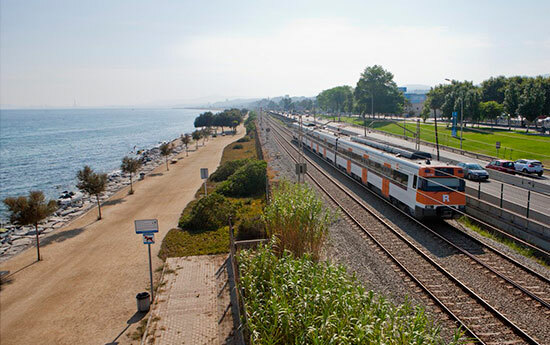 Undoubtedly, the train is one of the best options to move from Calella to Barcelona (either to the city or to the airport): it is fast, there are a lot of trains and they travel along the coast which allows you to enjoy an incredible view to the sea. 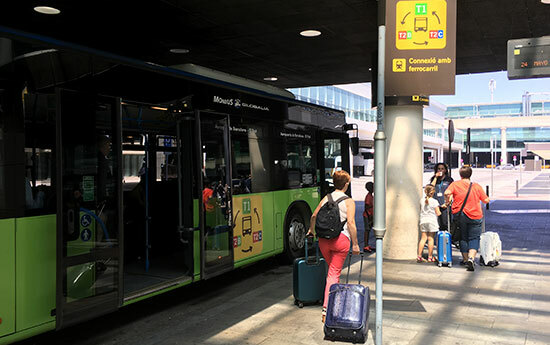 From Barcelona Airport to Calella (Line R2 and R1): This route requires to change train, The connection is good and fast since it is done within the same station (Barcelona-Sants). You only need to buy a ticket which allows you to travel to the airport. You will only have to change platform. At the airport the train leaves from Terminal 2 (T2). Those who have a flight departure or arrival at Terminal 1 (T1), do not have to worry since there are free shuttles that connect both terminals which are 5 minutes away from each other. The bus runs on a regular basis every 10 minutes throughout the day. At Terminal T2 train station at there are no ticket offices but ticket vending machines. You can also find a worker to address to if you have any question. 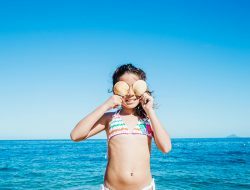 The train journey takes about 15-20 minutes to get to Barcelona-Sants Railway Station where you change to R1 Line, where you can find the train that will take you to Calella. From Barcelona to Calella (Line R1) (Barcelona-Sants and Plaça-Catalunya Train Stations): This train line connects Barcelona with Calella. 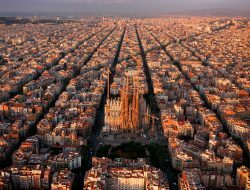 It has many stops within Barcelona but the two most important ones are Barcelona Sants and “Barcelona-Plaça Catalunya” stations (the last one located in the centre of the city.) 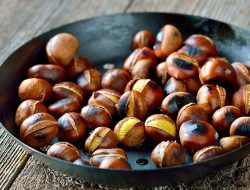 This stop is the most used, since most touristic points of interest are close to it. If you are a group travelling together or you are going to take the train on more occasions it is better to buy a T‑10 card (10 trips) as it is cheaper. Important: DO NOT THROW the ticket until you leave the station; you must have it to access or leave the platforms. 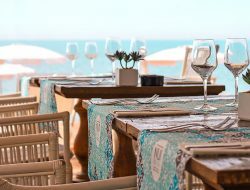 Calella train station is located in the centre of the town and next to the beach. From there you have a 5 to 10 minute walk to most of the hotels. There are also taxis outside, so if you have a lot of luggage, you can take a taxi to your hotel for a fairly reasonable price. Barcelona Plaça Catalunya Train Station (city centre): It is next to the Gothic Quarter, Las Ramblas and Mercat de la Boquería Market, and only a 15 minute walk to the harbour. 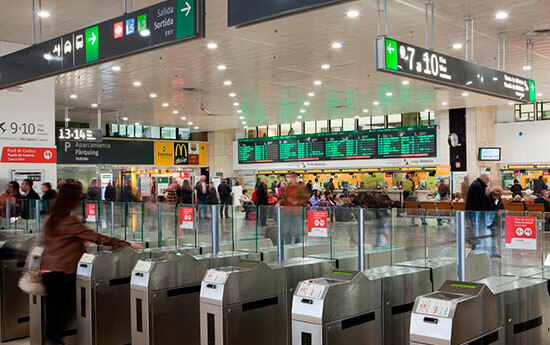 Besides, this train station is perfectly connected with Barcelona metro, with the bus-turistic (ideal for sightseeing the most touristic places in Barcelona), and with taxis. Barcelona Sants Train Station (to change to another train to El Prat Airport and AVE -High Speed Train-): This is the largest train station in Barcelona, and it connects a lot of train lines, including access to AVE. 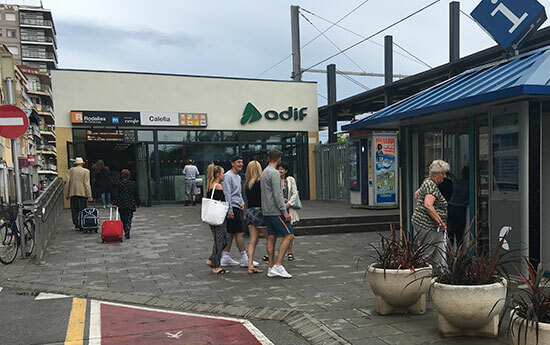 This station is open 24 hours a day, but beware of pickpockets and opportunists: always check your luggage and your personal belongings especially at this train station. 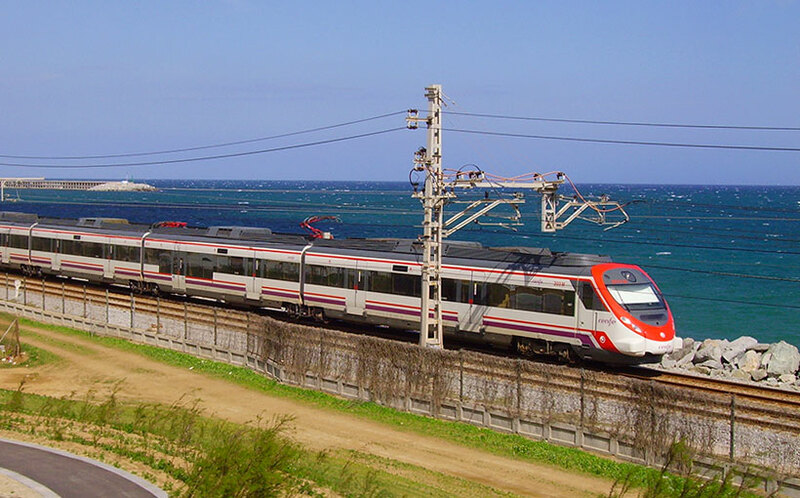 The commuter trains to and from Barcelona are quite punctual and leave every 20-25 minutes from 6 AM to 11 PM. 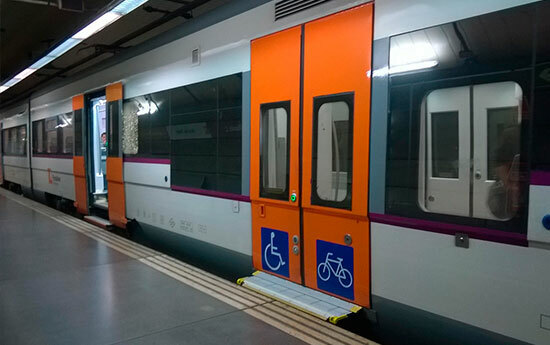 At rush hours there is usually a train every 10 or 15 min, it is a good idea to look up all the trains on the Rodalies website or download its APP «Rodalies», which is very friendly and easy to use. Pets: You can travel with your pet; wagons have room enough to allow animals. Dogs should always wear a muzzle. Bicycles and luggage: Almost all commuter trains have a space to carry bicycles. Once on the train you will see that some wagons are signposted for bicycles. The station has wider accesses where you can get in or out with your bike. Referring to luggage, you can carry up to three (3) suitcases per person. Other curiosities: Sometimes street musicians get on the train to play live and pass the cap after the performance (to ask money from travellers). There are not so many, but sometimes, you will be hearing their music while travelling.